Apologies for being away for a while, since my last post, I’ve now relocated to the US and the past few weeks have been manic as you will imagine. I’ve been eager to write a recipe post for the last few weeks but have not had the time, mental space or creativity since the ‘big move’. 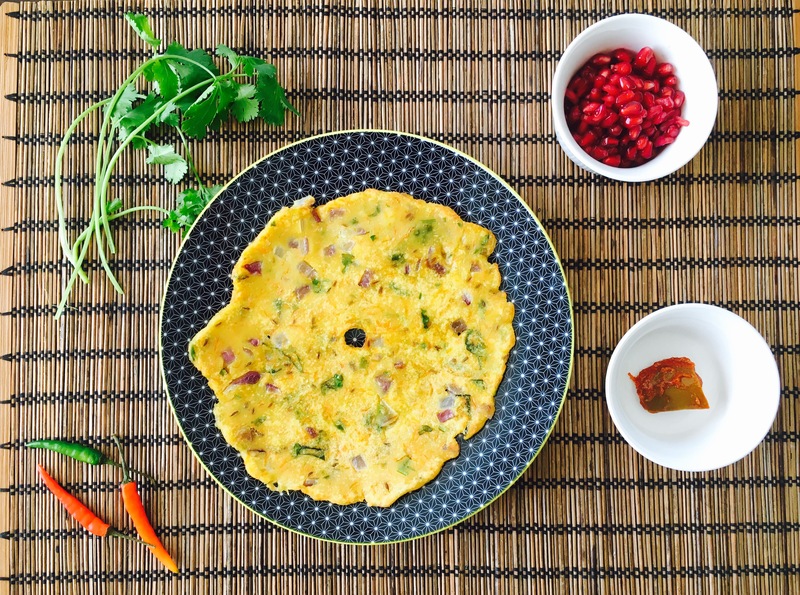 So finally, here it is – a traditional Karnataka recipe – the humble Akki Roti. I usually have an oat porridge with berries/ banana for breakfast as I dash out in the mornings and this has become a habit now as its so convenient and easy to put together especially for us that work-full time jobs, there just isn’t enough time in the mornings. On weekends though I make all the time for a home-cooked, traditional, Indian-Style breakfast, they are all mostly savory. This one in particular is a personal favorite and is very easy to prepare. If you are from Bengaluru then you know that once the dough is made it can be stored in the fridge for a day or two for later use. There a variation recipe that uses Raggi flour instead or Akki (Rice) flour, all the other ingredients and steps would remain the same. Feel free to try either. Important: You will require a square piece of parchment paper to manually pat-roll the dough using your fingers before transferring it to the hot pan. Traditionally, we use a banana leaf to do the same job. Start by finely chopping the onion, green chili, coriander leaves and curry leaves. Finely grate ginger and carrot. To a large mixing bowl, add in the rice flour, salt and mix using fingers. Then add in the chopped onion, green chili, coriander leaves, curry leaves, cumin seeds, grated ginger and carrot. Mix well using your fingers until well incorporated. Then add the warm water, a little at a time and mix using fingers to form a smooth dough. Rest for approximately 5-10mins. Portion the dough to equal parts and roll into small balls. Add 2 teaspoons of oil on the parchment paper and spread. Wet your palms with water, then place the dough ball on the paper and gently press it out into a flat roti (try to maintain the round shape). Make a tiny whole in the centre using one of your finger. Heat a frying pan, set heat to medium and flip the parchment paper with flattened roti onto the hot pan. Drizzle with a teaspoon of oil into the whole in the centre of the roti and around it. cook with lid on for a minute or two. then flip over and cook the other side. Serve hot with pickle or a fresh coconut chutney. Tip: Remember that dough needs to be flattened out by patting it using your fingers. If you feel that the dough is sticky, then just wet your palms with water this will stop it from sticking to your fingers. The dough cannot be flattened or rolled directly on a hot pan, it will not spread evenly and will cause issues. Never seen such a beautiful akki roti!